Our sister-in-law is from Trinidad and she cooks a mean curry. But I have fallen in love with one dish – Chicken puffs. I admit as an 80’s child I loved profiteroles – but as I can’t eat cream I usually steer clear of them. Well… I love these… I’ve eaten way too many! Heat the water and butter in a saucepan until the butter is all melted. Take the pan off the heat, add the flour and stir and beat until it’s formed a ball of dough. Next let it cool for 15 minutes otherwise the eggs will curdle. Then slowly and patiently beat in the eggs one at a time until you’ve made a smooth mixture. Next pipe (or dollop) onto a greased tray and bake in the oven for 20-30 minutes at 180 degree Celsius. As I said this is my sister-in-law’s recipe and she makes it sound so simple. For the filling steam or roast 2 chicken breasts, strip the meat and add salt and pepper, chopped coriander, crushed garlic, finely chopped chilli and mayonnaise to bind the whole lot together. Once the pastry puffs are cool, split them open and add in a spoonful of the chicken filling and serve. These can also be made with cheese and onion filling, or maybe spicy minced beef… let your imagination run wild! 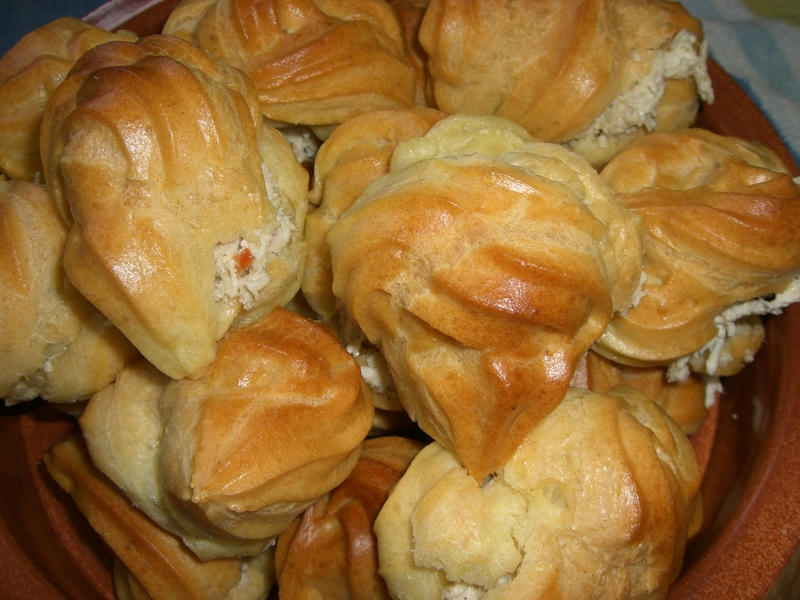 This entry was posted in Recipes and tagged Choux pastry, Profiterole, Trinidad. Bookmark the permalink.